Whatever holiday you celebrate in December, 'tis the season to get ready for the Southern California Linux Expo SCALE 10X, the 10th anniversary edition of the first-of-the-year Linux expo in North America. SCALE 10X starts a month earlier in 2012 than in past years, and runs from Jan. 20 to Jan. 22. Dot-org booths are still available on the expo floor. If your project needs some exposure, SCALE -- with nearly 2,000 attendees -- is the perfect place for it. For information on booths, e-mail gareth@socallinuxexpo.org . Sponsorship opportunities are also still available. For more information, e-mail sponsorship@socallinuxexpo.org . 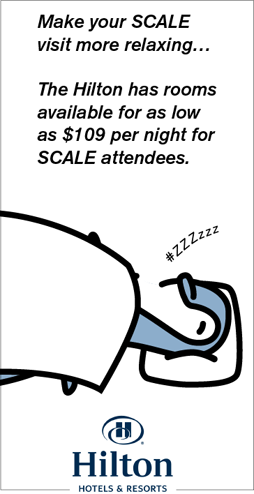 Registration continues for SCALE 10X -- don't delay! Register for SCALE 10X by visiting https://reg.socallinuxexpo.org/reg6/ . See below for discount hotel rates, which are still available for SCALE attendees. LPI EXAM CRAMS/LPI EXAMINATIONS: As part of SCALE University, LPI will be hosting the LPIC-1 and LPIC-2 Exam Cram courses on Friday, Jan. 20. Sharpen those No. 2 pencils and prepare for the exams, which are being held on Sunday, Jan. 22. The LPI will offer exams for all three levels of LPI certification at SCALE 10X. For more information, visit https://www.socallinuxexpo.org/scale10x/events/lpi-exam-certification . BSDA CERTIFICATION EXAMS: But wait, there's more. The BSD Certification Group (BSDCG) is pleased to offer the BSDA certification exam to attendees of SCALE 10X on Sunday, Jan. 22. Participants need to register for a BSDCG ID. Once you have an ID, you can choose an exam location and pay the $75 fee for the exam. For details, visit https://www.socallinuxexpo.org/scale10x/events/bsda-certification-exams . DISCOUNT HOTEL RATES: A special conference room rate is available at the Hilton Los Angeles Airport. Rooms are available at $109 per night, plus tax if you reserve online or use the special group code. For reservation information, including the discount codes, visit https://www.socallinuxexpo.org/scale10x/hotel-and-venue . The Southern California Linux Expo SCALE 10X will be held Jan. 20-22 at the Hilton Los Angeles Airport hotel. For more information, visit http://www.socallinuxexpo.org .